Bring a touch of sweet cottage style to your front porch decor. There's nothing quite as relaxing as an inviting LuxCraft Porch Rocker to kick back in with a cool glass of lemonade. This Amish rocking chair is built in Ohio by skilled Amish craftsmen who focus on durability, beauty, and longevity when they create your solid wood furniture. The price is right on this delightful Amish rocker. Select a pair for yourself and keep the LuxCraft Porch Rocker in mind for the perfect housewarming or birthday gift! Little ones will love to pick their favorite picture book to enjoy as they rock and enjoy the outdoors. 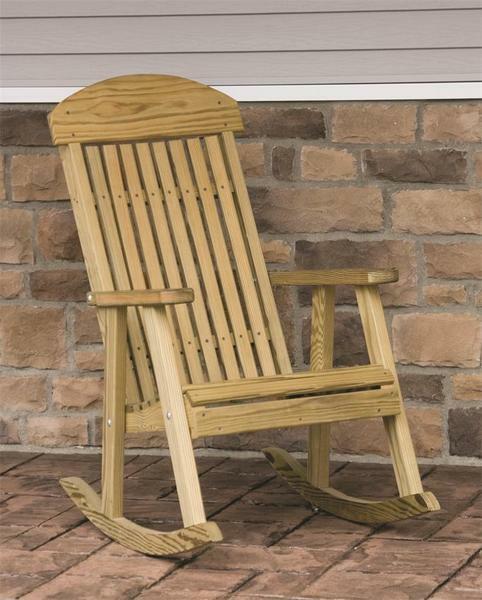 Complete your lovely porch scene with a rocker that is built to last. This product usually ships within a week or two of purchase. If the stained finish is selected, please allow two to three weeks for finishing. Be sure to review our selection of Amish Porch Swings to add to your porch. We also offer fantastic ideas for outdoor seating options on our DutchCrafters blog. Call one of our Amish Furniture Specialists today at 1-866-272-6773 with any questions. Seat Height at Front: 17"
Seat Height at Back: 13"
Pressure Treated Kiln Dried Yellow Pine.